Today, The Breakfast Club will be released in all of its remastered glory on DVD and Blu-Ray. It will also screen in Austin next week, as well as at 430 theaters around the country on March 26 and March 31, 30 years after it first gained widescreen release. 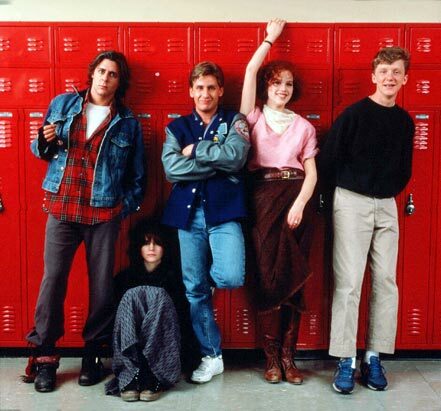 In honor of all that, I was going to write this whole thing about why The Breakfast Club is all about hope and also why it’s kind of like Jean-Paul Sartre’s No Exit, but then I just decided to talk about “Larry Lester’s buns.” Seriously. I remember being a child and not understanding what the line meant, but even then I knew that Emilio Estevez’s character, Andy, was saying something funny, while his eyes were all wet. I knew it was important. The line is the start of a monologue written comedically, and spoken with all the anguish in the world. It’s the absolute heart of why this movie works so beautifully and means so much to so many. Let me set the scene where this line takes place: all five students have broken down their barriers (with the help of some pot) and now they’re sharing their stories of what got them stuck in detention in the first place. For some of them — Judd Nelson’s John aka The Criminal — it’s obvious. For others, it’s more surprising. Sheedy’s Allison is there because she had nowhere else to be. And Hall’s Brian is there because he brought a flare gun to school in a tragic, scattered attempt to alleviate the shame he felt for failing shop class. But it’s Andy’s story that really gets me. He’s the jock, the bully. And while in most — no, all — high school movies we learn why bullying is wrong from the perspective of the victim, we never hear the remorse, the utter self-loathing, of the bully himself. Estevez’s performance is subtle, tender even. It’s hard to imagine him attacking anyone with his upturned eyebrows and doe eyes, but as his anger starts to roil in a few words and micro-expressions of pain, we suddenly begin to understand why people do horrible things to other people, even if they’re not bad people themselves. Everyone in the room knows of the event and is surprised to learn Andy is the one behind it. “Well, then you know how hairy he is. And when they pulled the tape off, most of his hair came off and some — some skin, too,” he says. The monologue is not an apology, nor is it an excuse for brutal humiliation and bullying, but it is an act of remorse so human and so real, and so utterly difficult to watch it breaks your heart for this Larry Lester character we never actually meet, just as much as it breaks your heart for Andy. Because something in his eyes shows he’s the Larry Lester in his father’s life and will never be anything but that to him. And the more abuse he takes, the more he turns it onto others. A little bit later in the film, Andy asks, “My god, are we gonna be like our parents?” The question of whether the cycle of abuse and mental manipulation can be broken by the sheer individual will of a person who knows better is a question that isn’t asked enough. Or at least, it’s not asked in such simple, perfect terms. And while the movie suggests that there may be hope, it does more to raise the question in the viewer’s own mind. Are you strong enough to challenge the authorities (whoever they may be in your life) and do what’s right for you? As director John Hughes drives home, authority figures see people in the “simplest terms, the most convenient terms.” Hughes does not. In any other movie, Andy’s character would have just been the bully, but instead we learn what led him to that label may just be what leads him away from it, because he’s so much more complicated than anyone realizes. We all are.